We know what you're probably thinking - "Half size TV Covers? What's that?" It's our solution for low maintenance TV protection! Made from rugged commercial quality vinyl with a polyester lining, these covers go over the front and half the back of your TV. They're water, tear, puncture, and UV-resistant. In other words, they're going to keep your outdoor TV in great shape for a long time! While our Classic Half TV Covers only cover half the back of your TV, that doesn't mean they lack in providing protection. We include grommets on the back and a heavy drawcord so you can cinch it tight, keeping it on in all weather conditions. And even if the weather does get bad, you can easily wipe it clean with a damp cloth or sponge. 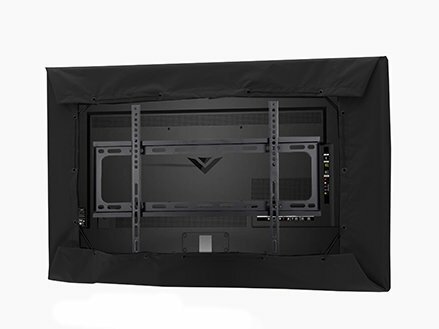 Available in 12 popular sizes to fit most flat panel televisions, our Half TV Covers are a must for anyone who likes enjoying their favorite shows outdoors! This TV cover is not recommended for locations where the back of the TV is in direct path of outdoor elements, such as water, snow or ice.